Yesterday night, I was invited to a dinner in a friend’s house and upon arrival at their place I was totally smitten by their garden that is filled up with lots of tropical fruits. But what particularly called my eyes was the santol tree that is loaded with fruits. 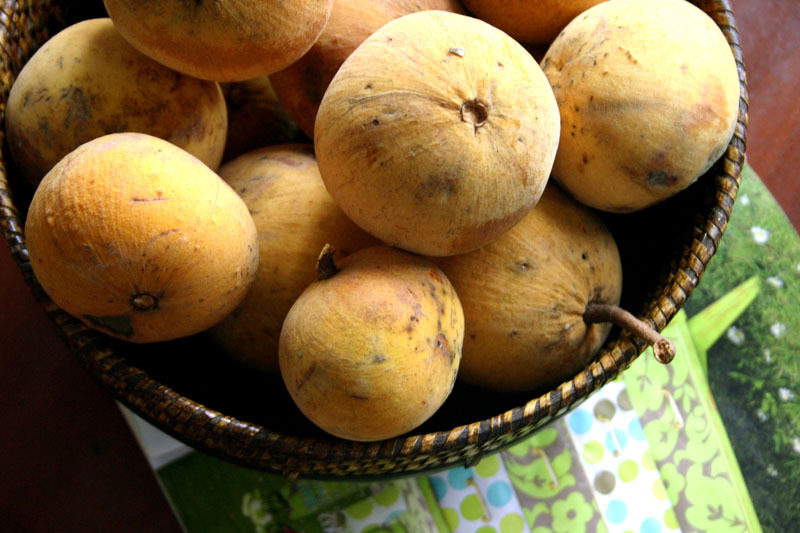 Santol (Sandoricum Koetjape) is tropical fruit very popular in Philippines and other Asian countries. The fruit is said to be indigenous to the old Indochina and the Malaysian Peninsula. There are two varieties of santol ; the yellow and the red one. The thick skin needs to be taken off to see the pulp and seed in the middle. Santol is a fruit that you can eat raw with some salt or shrimp paste (bagoong) but other than that these are the different recipes that make use of santol. Enjoy!